I’m happy to report one completed project, “Baby Bobbi Bear” by Blue Sky Alpacas, and one nearly completed project, my “Union Jack” cross stitch design. Baby Bobbi Bear started out as a gift for my niece Ella’s first birthday — she is now four (or, as she would insist, four-and-a-half). Ahem. Then BBB (as I will refer to him from now on) was intended to be a gift for her sister Lauren’s second birthday, which was in late February. Double ahem! There’s nothing like sticking to your goals! Anyway, next it was intended to be a gift for Lauren for Easter, but I also wanted to make a couple sweaters for BBB (just in case he gets cold) so I’ll be putting off giving him to Lauren for Easter. But I’ll get it to her soon. I promise. Blue Sky Alpacas has a free pattern that looks quick and easy. I’ll also probably knit up a hat or scarf. I’ll post a picture of the finished BBB soon. 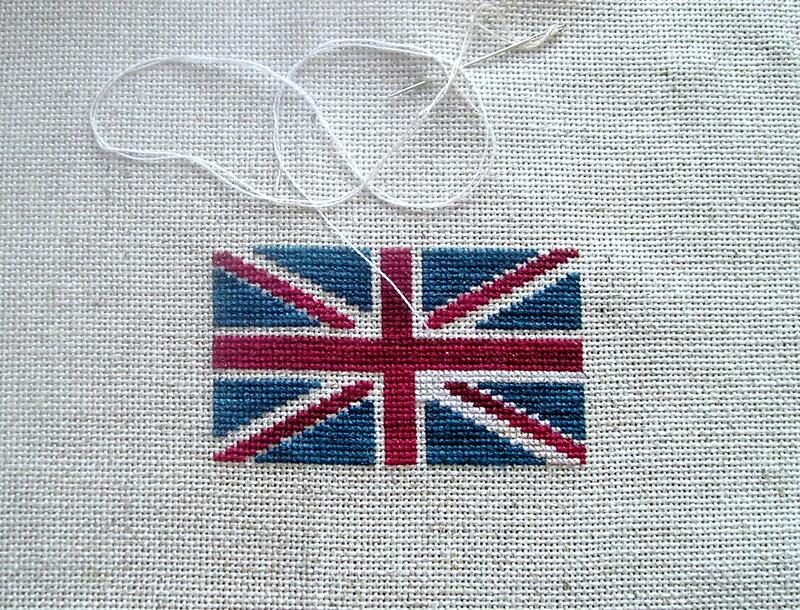 The “Union Jack” freebie sample stitching is coming along nicely, especially considering I spent what felt like an eternity fiddling with what is, after all, a very simple charted design. I added a row on the sides, took off a row on the top and bottom, added those top and bottom rows back on, added the side rows back on plus another row on either side, removed the top and bottom rows again… and so on. You get the idea. I’ve tried to be as accurate as possible with the proportions, which is not easy considering that the slanting red stripes don’t line up “properly” in the original (that’s just my humble American opinion). What were those Brits thinking? I love Union Jack designs and I chose here the same kind of weathered, variegated (“tweedy”) colors that I chose for the Debbie Bliss Union Jack pillow cushion I knitted in Fall 2012 as my Ravellenics project. In this case, I am stitching over one on 25-count oatmeal Jobelan with one strand of Gentle Arts Sampler Threads in Midnight (blue), Weathered Barn (red) and Oatmeal (off-white). When I print out the chart for Wordsmith Designs, I will offer some alternative color suggestions for people who want to use DMC/Anchor, Crescent Colors or Weeks Dye Works, or for people who want be more accurate to the colors in the actual flag. I should be finished soon. Rule Brittania! 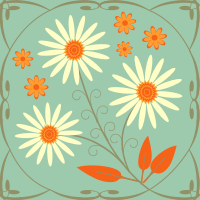 If anyone would like a copy of the charted design, send me a message. Thanks! Update: The Union Jack pattern is now available on my “Free Patterns” page. Just follow the menu link at the top of the screen. I’d love to see some photos of finished stitched pieces! Hint, hint. Thanks, frilka! It’s nice to know that people like what I’m working on and that they take the time to let me know. I love your little bird cross stitch — it’s adorable.